When roasting vegetables in the oven or in a frying pan, it is customary to use at least a small amount of cooking oil. Oils help to keep vegetables from sticking to the cooking surface. However, many oils also contain unhealthy fats. 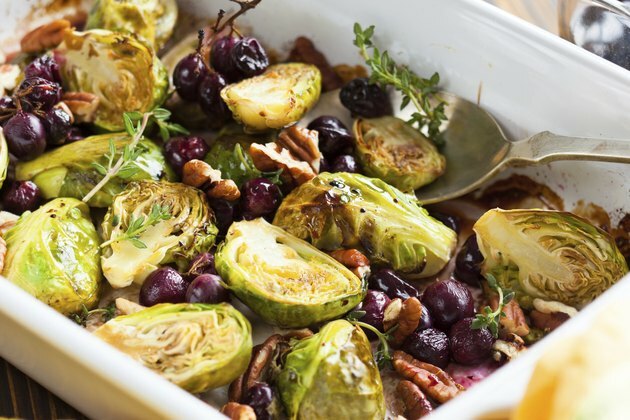 For a healthier alternative, try roasting vegetables without using oil. One of the primary reasons that even health-conscious cooks resort to the use of cooking oils is to prevent vegetables from burning and sticking to the pan. Using nonstick pans treated with Teflon or a comparable substance is one way to help eliminate oils from your diet without burning all of your vegetables. However, keep in mind that you don't want to heat an empty nonstick pan for very long, as the Teflon can begin to burn and smoke at temperatures above 600 degrees F.
Another way to roast vegetables without oil and also avoid burning and sticking is to add water. If you're cooking over an open flame, you may need to begin by adding a cup of water when you begin roasting your vegetables, and add a cup of water as needed throughout the cooking process. If you're roasting vegetables in the oven, it's usually sufficient to add one cup of water to the baking pan prior to roasting. There are many alternative liquids that are lower in fat and can be substituted for oil when roasting vegetables. Using an oil substitute will prevent your vegetables from sticking and lend them a distinctive flavor. A small amount of vegetable broth or chicken broth can be used in the bottom of a frying or baking pan. Other alternatives include cooking wine or cooking sherry, tomato juice, lemon juice, rice vinegar, balsamic vinegar, soy sauce or Worcestershire sauce. When roasting vegetables without oil in the oven, use high heat and cook them long enough for them to caramelize on the outside. Food website Whole Story recommends this method for vegetables that stay juicy on the inside but brown and caramelize to add flavor to the outside. For example, try roasting portobello mushrooms in the oven at 375 degrees F for between 15 and 20 minutes, adding a small amount of soy sauce or other liquid for flavor. Psychology Today: Are Nonstick Pans Dangerous?